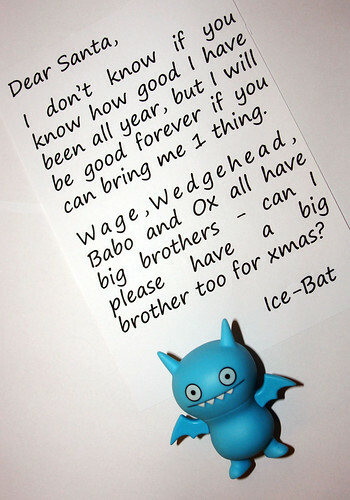 Uglyworld #222 - Ice-Bat's Letter To Santa, originally uploaded by www.bazpics.com. This morning started off quite sad, when myself and Mireille woke up we could hear some feint sobbing coming from downstairs, so I got up to find out what was wrong. When I got to the living room I found Ice-Bat sitting on the couch crying, so I asked him what was wrong. He replied, "I really really really want a big brother too, like the other uglies have, I've been super nice this year too!!!" and then wailed some more into a never ending pile of tissues. I told him that it would maybe help if he sent a letter to Santa about it all, he started looking at me stupidly and said, "How will that help? ", so I explained to him that here when it gets to this time of year and you've been good all year you get the chance to write a nice letter to Santa, and if you're one of the lucky people to be chosen then Santa makes your wishes come true. Ice-Bat immediately flew over to my desk and brought back a pen between his feet and when he reached the table he hovered just above it and began writing a letter to Santa on a piece of paper I prepared for him. He seems to be a little happier now, I just hope his letter gets to Santa in time for him to make his wish come true, and he needs the support of all his Ugly cousins around the world too to make it happen!! !